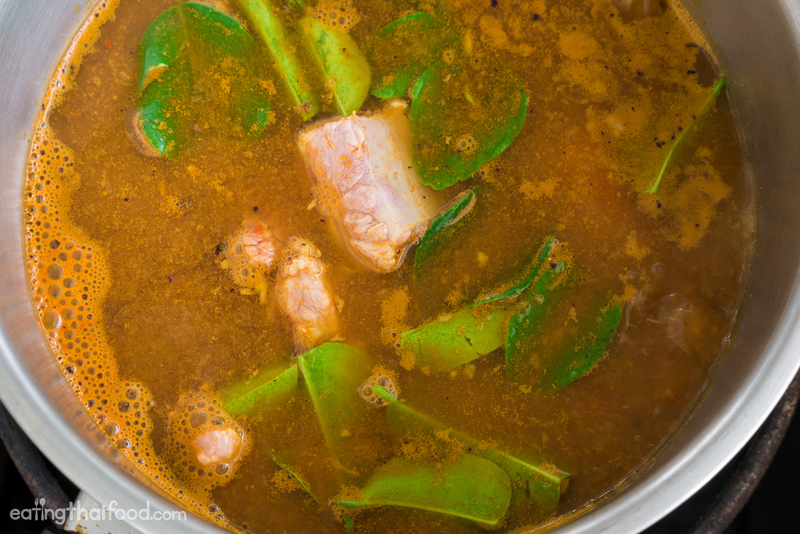 In this authentic Thai recipe from my Thai mother-in-law, you’ll learn how make Southern Thai dry chili curry with pork ribs. 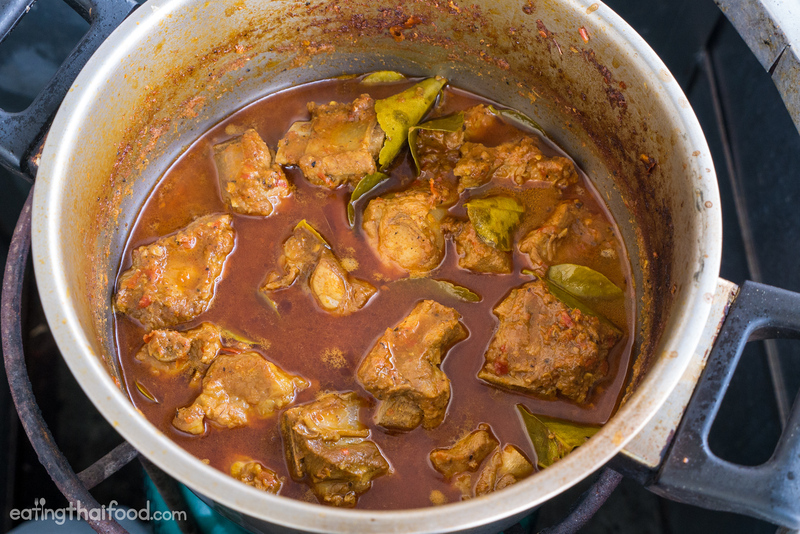 You’re going to pound the curry paste from scratch, boil it with bite sized pieces of pork ribs, and it’s going to be one of the most massively flavorful Thai curries you’ve ever tasted! If you have a few minutes, first press play to watch the video below so you can see how to make this recipe and the exact method of cooking. My mother in-law is one of the best Thai cooks I know. She cooks a lot of Southern Thai dishes especially (because my wife’s family is originally from Southern Thailand), and this happens to be one of the Thai curries she cooks for me on a regular basis. The name of this curry in Thai is gaeng khua prik (แกงคั่วพริก), and we’ll be making it with pork ribs (ซี่โครงหมู seekong moo), but you can make it with chicken or beef, or any meat you choose. This Thai curry is known for being spicy, and it really makes amazing use of dry chilies, which not only provide some heat, but incredible chili fragrance. Some Thai curries, like green curry for example, use coconut milk. But this dry chili curry uses no coconut milk, so all the spices and chilies are powerfully flavorful. NOTE: If you want to get straight to the recipe cooking instructions, you can scroll down to the recipe box below. But if you want a more in-depth explanation of this curry and more photos, keep reading. 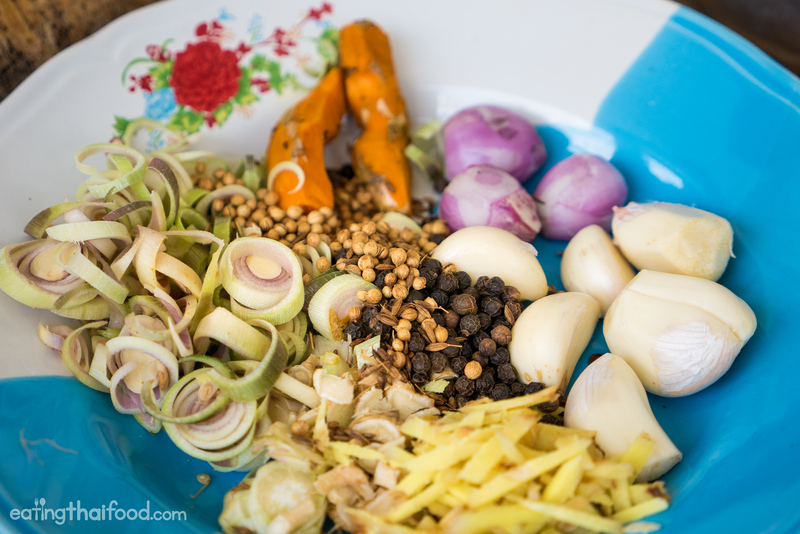 Like with all Thai curries, the secret of making authentic Thai food is in the curry paste. This is where all the spices and herbs are pounded together to create magical tastes, and the paste is where just about all the flavor resides. Since this is a Southern Thai dry chili curry, Thai dry bird’s eye chilies are a mandatory ingredient. 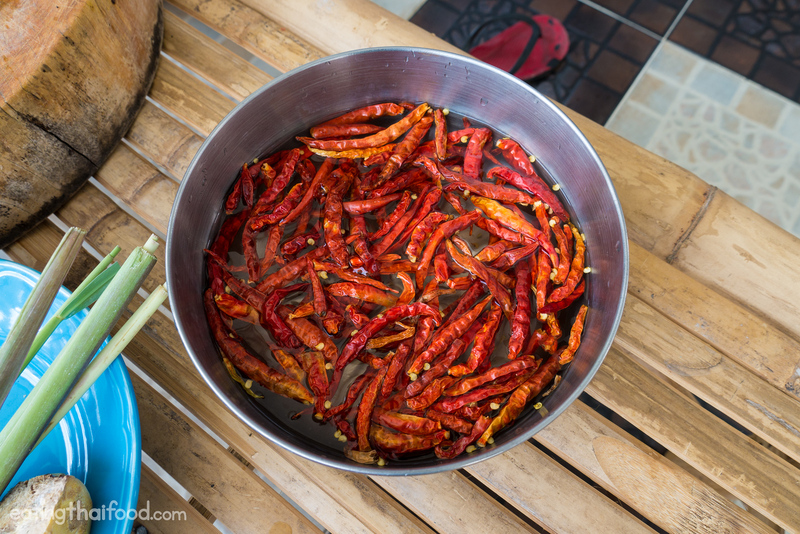 Soak the chilies in water for about 5 – 10 minutes. My mother in-law told me this will help with the pounding process, so they’ll break down easier. For the cumin seeds and coriander seeds, in order to maximize their fragrance, stir fry them in a dry pan or wok for about 30 seconds. This is just going to toast them and bring out their fragrance. Then basically just slice and dice up all the fresh herbs and curry paste recipe ingredients so they are small sized and easier to pound into a paste. Do I have to pound by hand? When you pound Thai curry paste by hand using a stone mortar and pestle, you will have the best tasting Thai curry ever. The reason is because it’s a slow process, and all the oils of the spices have time to fully be released and maximize their flavor potential. That being said, pounding your curry paste by hand is time consuming (about 1 hour). So rather than buying curry paste in a can, the next best option would be to blend all the fresh ingredients in a blender or food processor, with a tiny bit of water to get them going. So if you have to do this, I understand! To pound the curry paste by hand, first add in a tsp. of salt, then pound all the ingredients, no specific order, just pound them all (everything apart from the shrimp paste which you’ll add at the very end). It will take 45 minutes – 1.5 hours to pound your curry paste. One of the indicators that your curry paste is ready is that you should barely see any chili seeds left, they should nearly all be pounded out. Once you think your curry paste is done, then add the shrimp paste, and mash and pound for another minute until it’s fully mixed in. 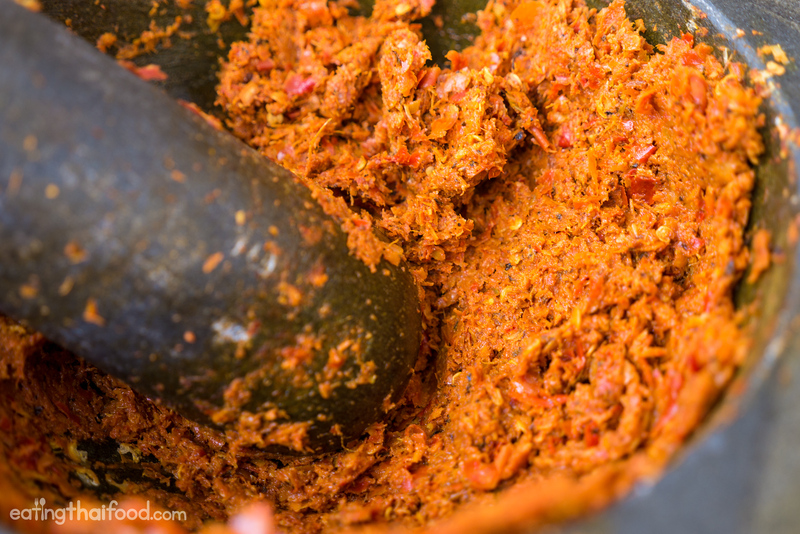 Congratulations, your authentic Thai dry chili curry paste is ready. Again, we’ll be making this Thai curry recipe with pork ribs. But feel free to substitute chicken or beef or any other meat of your choice. My mother in-law often makes this recipe with free range chicken, which I love as well. 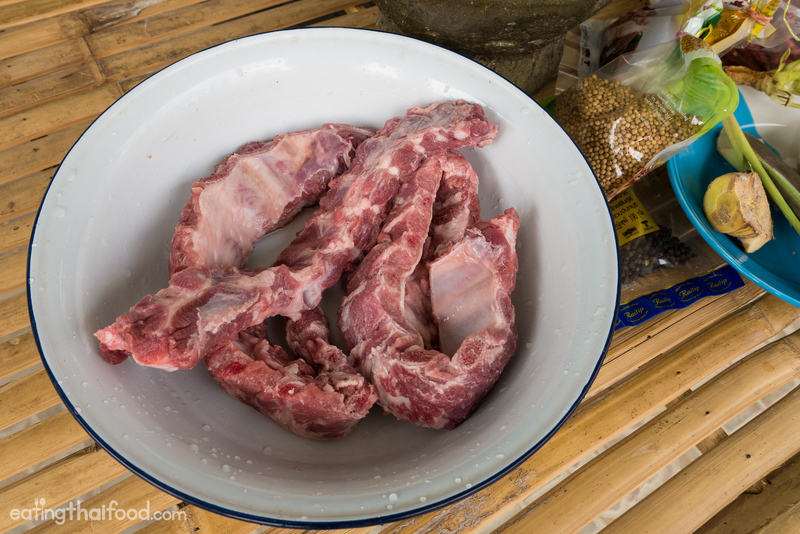 In Thailand, the ribs from the market usually are cut down the center and come in thin strands so that they can be cooked bite-sized. I’m not sure if you can get your butcher to cut them like this for you, but also whole bone ribs would work fine too. Then just cut your ribs into single bone bite sized pieces. When you reach this stage, most of the hard work is done, and it’s very easy to cook this curry. Again, I can’t emphasize enough that the flavor of this dish and the work comes from the curry paste preparation. To begin with, first add 2 – 3 cups of water to a medium pot. Then dissolve in about 6 or so tbsp. of the curry paste you just made, into the water (NOTE: If you’re worried about spice levels, you can reduce the amount of curry paste, and you can always come back to add more paste later). 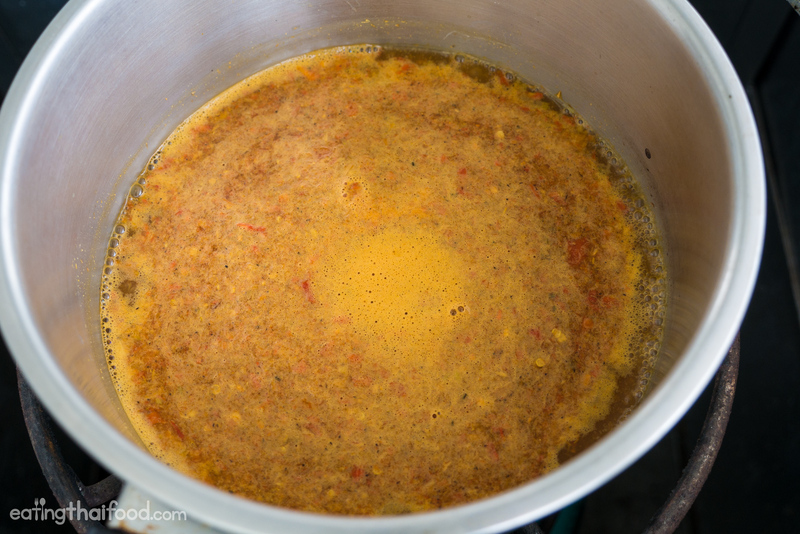 Bring the curry paste water mixture to a boil, and then toss in your pork ribs. At that same time, get about 10 kaffir lime leaves, roughly tear them with your hand, and sprinkle them into the curry. On a medium high heat, bring the curry to a boil, and then simmer it. My mother in-law boiled this curry for about 1 hour, but she specified that it needed to mainly boil so long in order for the pork ribs to get nice and tender. So 1 hour is a good time-frame guide, but it’s really not a big deal how long you boil it as long as your meat is tender. While you’re boiling the curry, if it get’s too dry and you still need to boil it longer, add some more water. The main goal is when you’re done cooking this curry, you should have a nice thick curry consistency. But you can keep on adding water, and boiling it away. Make sure you taste test and add salt as needed. But be careful with the salt, because remember that you’re already getting some saltiness from the curry paste. We added about an extra 1 tsp. of salt when we were making this recipe. Also, at this stage you can add more curry paste if your curry isn’t strong enough or spicy enough. After about an hour of simmering, your Thai dry chili curry (gaeng khua prik seekong moo แกงคั่วพริกซี่โครงหมู) should look something like this. A nice thick curry sauce, and tender pieces of meat. And that’s it. The next step is to dish the dry chili ribs curry into a bowl, and eat it while it’s hot along with rice. You’re about to experience a flavor explosion you’ll never forget! 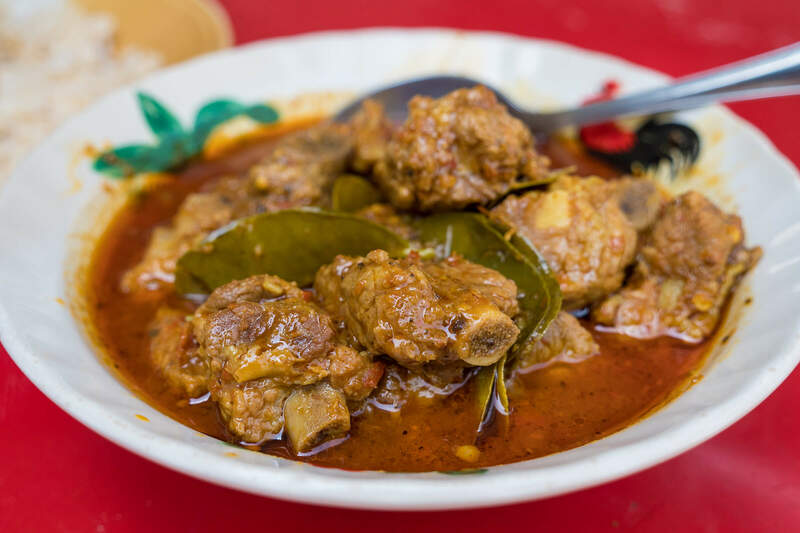 Make this authentic Thai recipe for Thai dry chili pork ribs curry (แกงคั่วพริกซี่โครงหมู) if you love authentic Thai food and massive flavor. This is a southern Thai curry that my mother in-law loves to make, and I can guarantee you, it will give you an overload of flavor (also, if you're worried about spice, you can reduce the amount of curry paste). Enjoy! Using a stone mortar and pestle, add 1 tsp. of salt, then apart from the shrimp paste, pound all the curry paste ingredients together. Pound for about 1 hour to get a smooth paste consistency. When you think your curry paste in done, add the shrimp paste at the very end, and mix and mash for a minute until it's fully mixed in. In a medium pot, boil about 2 cups of water and dissolve in 6 tbsp. of the fresh curry paste (Note: you can start with less curry paste if you'd like, and add more if needed). 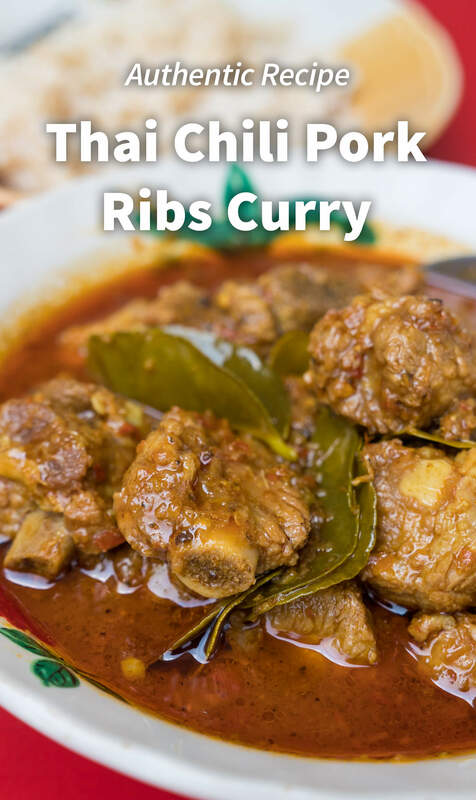 Cut the pork ribs into bite sized pieces, and add them to the curry. Take 10 kaffir lime leaves, tear them lightly with your hand, and add them to the curry. Slow boil for about 1 hour until the meat is very tender, stirring occasionally. You may need to add more water if your curry starts to get dry. Keep boiling and adding water as needed. The important thing is that when you're done cooking the curry, the water should mostly be evaporated leaving you a nice thick curry sauce consistency (you don't want watery). Taste test and add salt as needed. You can also add more curry paste if you want to bump up the spice and flavor. Once the pork ribs are tender and you have a nice curry sauce, turn off the heat, and you're done. This Thai dry chili pork ribs curry recipe (แกงคั่วพริกซี่โครงหมู) is an amazing Southern Thai dish that is packed with fragrant chili flavor. You'll want to dish it out into a bowl, and serve it hot with fresh steamed rice. If you loves spicy curry, this will be a dish you're going to love. Also, if you're worried about the spice, you can reduce the amount curry paste you use. Enjoy this authentic Thai recipe by my mother in-law! I love Thai curries with coconut milk. However, I do think that coconut milk kind of mellows out spices and flavor (not a bad thing at all, just mentioning). 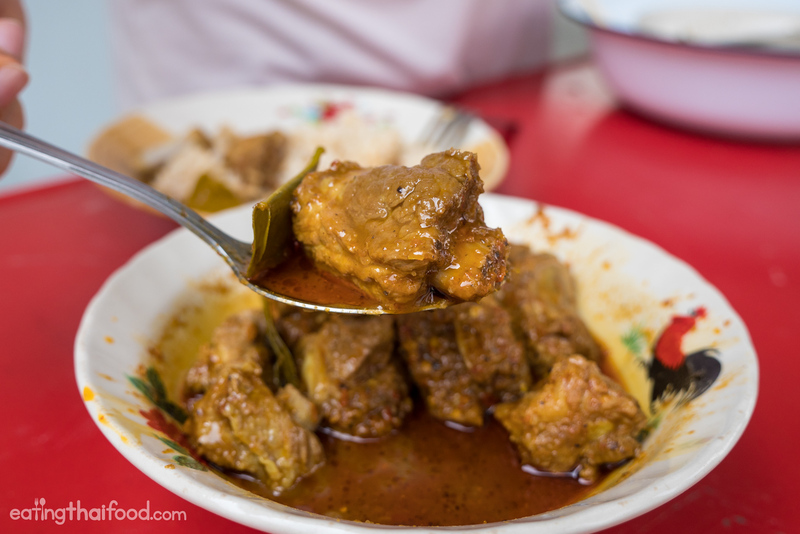 But with this Thai dry chili pork ribs curry (แกงคั่วพริกซี่โครงหมู) there’s nothing to mellow out the flavor of those dry chilies and spices, so you get the full on taste of all those curry paste ingredients combined with tender bites of pork ribs. 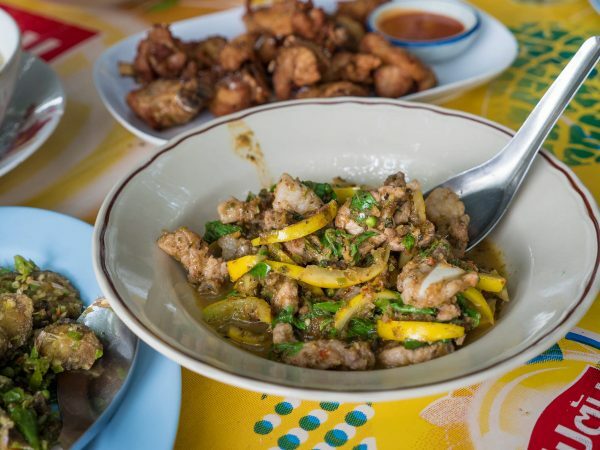 It’s just a sensational Southern Thailand dish! 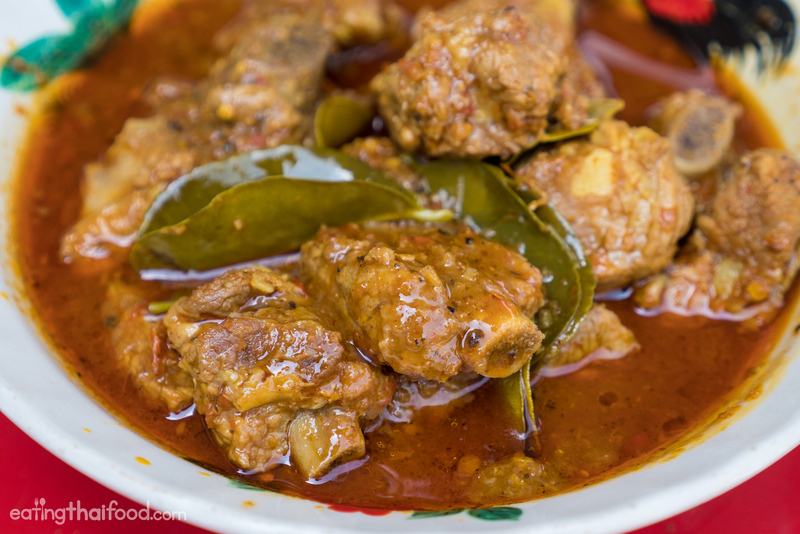 This Thai dry chili pork ribs curry recipe (วิธีทำ แกงคั่วพริกซี่โครงหมู) is a Southern Thai dish that my mother in-law loves to make; So today I’m happy to share this authentic Thai recipe with you. 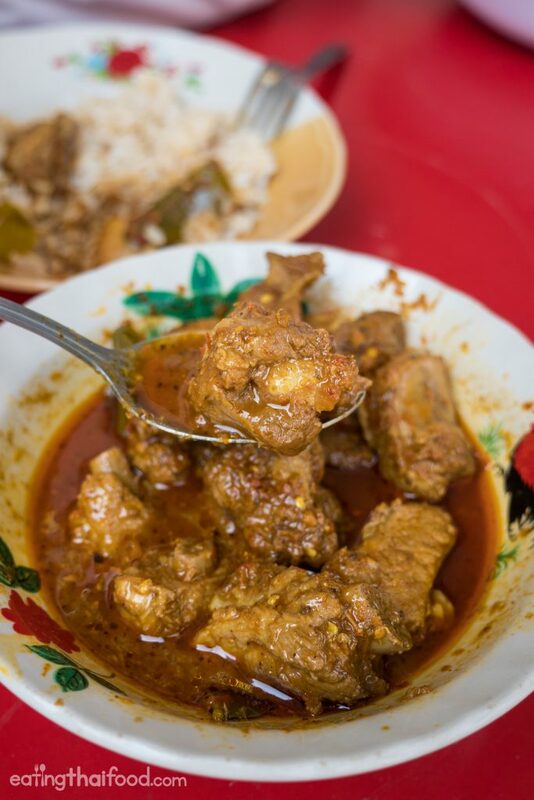 All of the work is in the curry paste, so once you’re pounded the curry paste, all you need to do is boil it with pork ribs, or your meat of choice, and you’ll have a Southern Thai curry that will blow your mind with flavor! Hope you enjoy this recipe, and I’d love to hear from you in the comments section below what you think. 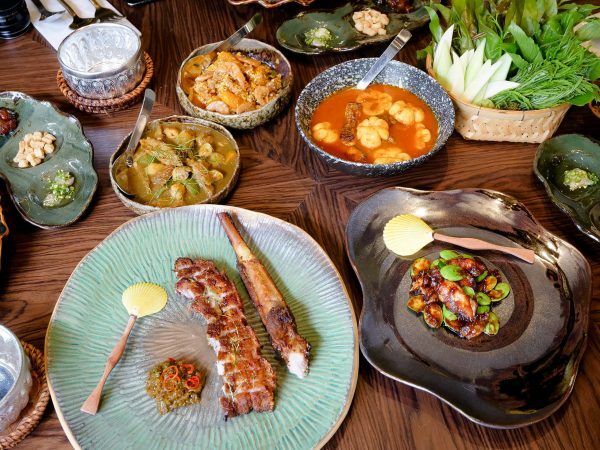 Also, check out more authentic Thai recipes here. 112 comments. I'd love to hear from you! Would it be acceptable to add some coconut cream or no? The video (the cooked dish part) shows a divinely prepared/cooked dish. It really IS worth the pain (sitting in that position, numbing hands and all), literally pounding all that stuff. I much rather use a blender at a slower speed so that “… all the oils of the spices have time to fully be released and maximize their flavor potential.”, even if it takes more time than the usual time used in blending (at least 20 min in a blender and NOT 60 min.). I trust that 20 min. of slow blending will still maximise the flavour of the spices. Made this today, my wife and I had our minds blown away. Fantastic meal. I had to modify it a bit for lack of ingredients, but having travelled extensively in Thailand it was still very authentic dish. Thanks a million. Thanks for sharing this, am making it as we speak and I will let you know what I got. I just made this. wow wow and wow . I love the videos they are way better than written instructions. Please send me and more you make. This truely is a wonderful dish, I added more garlic, and yes you need that extra bit of salt, go for the full compliment of chillies as recommended….. ate most of the curry before the rice was ready …… !!! Devine…….. one of the best curries I have ever had. I am an Indian, lived in Thailand for a very long time, love thai food and love cooking & eating food. Amazing recipe. 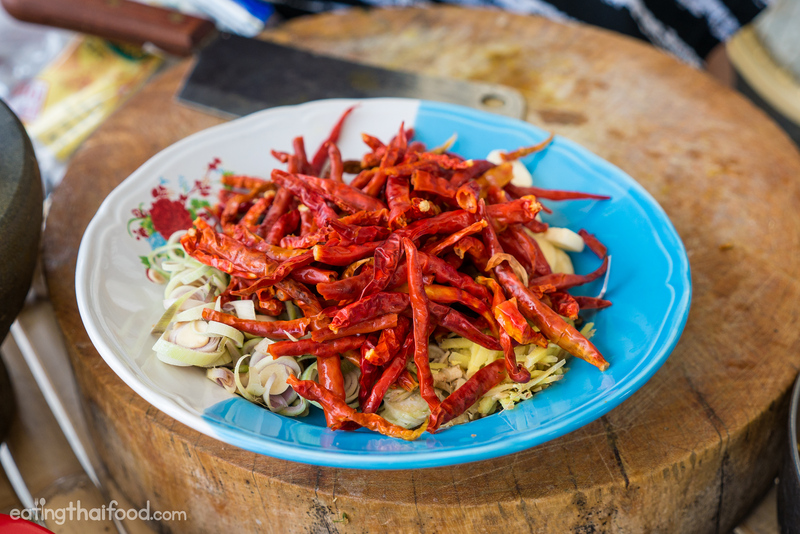 Hi Mark – I made this recipe over the weekend and was wondering if the 50-gram measurement for dry chili is correct… as that comes up to be 2 big handful for me using dry chilis bought in Malaysia (which I assumed would be fairly similar to Thai chili). The curry turned out… super spicy… as I thought my heat tolerance is pretty above average. My curry also turned out substantially more red than your picture. Love to try this recipe, Thanks for ssharing. Hi Mark, I just keep watching your programme, and am delighted your enthusiasm to share the recipe with us. I hope to experiment on this mouth-watering dish. Thank you. Hi Mark , I surprised my (Thai) wife with this wonderfull recipe. Lucky I putted less chili inside (10) and still it was spicy enough for my wife who doesn’t eat to spicy.Thanks , next I will make the green curry. Hi Mark – your enthusiasm is awesome. Thanks. If making a chicken version of this dish, how long would you boil the chicken for? I want the rich curry sauce and a not too dry chicken? Delicious, I just love cooking and now I going to try this recipe at my home. I know I’m not able to create delicious as you create it, but I will try it once. I am also planning to visit Thailand at the end of this year, I will definitely eat this. I think it’s better if you add a print friendly option for each recipe. Mark, I like many of your readers and followers do not live in that area of the world. I was hoping you might provide alternative ingredients available in some of the asian markets in America. I go to a market about 45 minutes away in Freehold , NJ which caters to primarily the Chinese population. Most of the ingredents comes from China,, some from Thiland. I know fresh lime and curry leaves are not available which is in both this recipe and the other one I would like to try, Fish head curry. Love the videos. Hope you may provide in the future a recipe book on some of the amazing dishes you have tried in various destinations. Just to let you know I am familiar with the NY style pizza here in NJ and when I was a child went to that pastrami and cornded beef place Katzs Deli in the lower east side..
A lot of the ingredients can be difficult to find locally, but we did order the lime leaves on line. Although I was doubtful, they were very good. Not quite as good as fresh from the tree, but they definitely had the big citrusy taste. Can I use red curry paste instead making the paste.? I love all of your recipes but I live remotely and have a very hard time finding a lot of things , like fresh turmeric ? My first recipe by you was Tom Yum Soup clear , All my friends loved it! I have to improvise a lot and still my Thai chicken basil turned out perfect as well as this rib recipe! Keep cooking ! Just made this recipe. Our apartment smells so good. Had to use the food processor because my mortar and pestle wasn’t large enough and subbed the shrimp paste for 2 teaspoons of fish sauce because I have a shrimp allergy. So excited to eat this and for the awesome recipes I can make with the leftover curry paste!!! 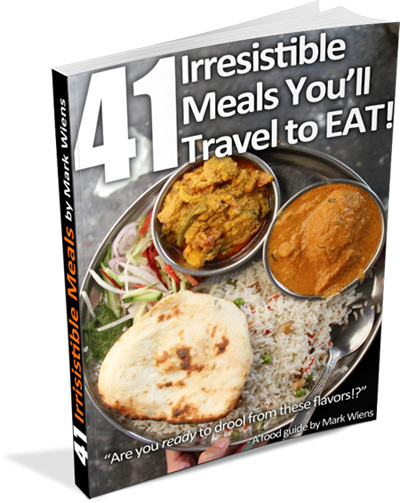 Thanks for making authentic Thai recipes accessible Mark! Blessings. Thanks very much for the recipe i loved it. It is the kind of Thai food that we dont find in English Thai restaurants. A bit on the fiery side for many i guess. I made it with ribs the first time and thought they went superbly. Im now using the remainder of the paste making it with chicken drumsticks which im salivating over right now. Keep up the great work and i look forward to trying further recipes. Thank you so much for sharing. I’ll let you know when I make it. It will be in quite a long time. Hi I just made this recipe today and I can definitely recommend it to anyone. Delicious ???? Can’t wait to try this. We got all of the ingredients today along with some thai eggplants and baby bok choy to cook as a side dish. This week I have try your Thai Fried Rice,Thai Basil Chicken and Dry Chill Pork Ribs( I make Chicken ). All off your recipe is very delisiuos ,all my family love it. Thanks Mark for the delicious recipe. I love it ! Looks like “Kang Hung Le” (แกงฮังเล) at first sight. I’ll try your recipe for my family when I’m back home in Chiang Mai during Song Kran Festival. Thanks for sharing ka. Do you have to use the thai chilies listed on the ingredients? Is there a substitute chili to use, if the that type of chili is not available? Not to many recipes make me go ‘I’m cooking that asap’ but the pictures in the email and then watching the video did. It’s bubbling away on the stove as I type . Luckily in Darwin we have access to all the ingredients, using baby back ribs. My partner loves his green ‘if it’s not spicy, I’m not eating it’ shirt. Very much enjoying your trips around Bangkok and surrounds and when you cook with your MIL. Awesome to hear that Rebecca, hope you enjoy your meal very soon. And say hello to your partner as well, glad he loves the t-shirt! Awesome video, so complete! Great job! I might not put as many chillies in when I make after seeing you M-I-L’s reaction after that taste test. Thank you very much Brad! Great to hear that Charlene, hope you enjoy it! Hey Mark, thank you very much, bbq smoked is pretty amazing too. I think if you can get to an Asian supermarket you’ll be able to get most of these ingredients. Sounds really good,will try it next month. Looks delicious. 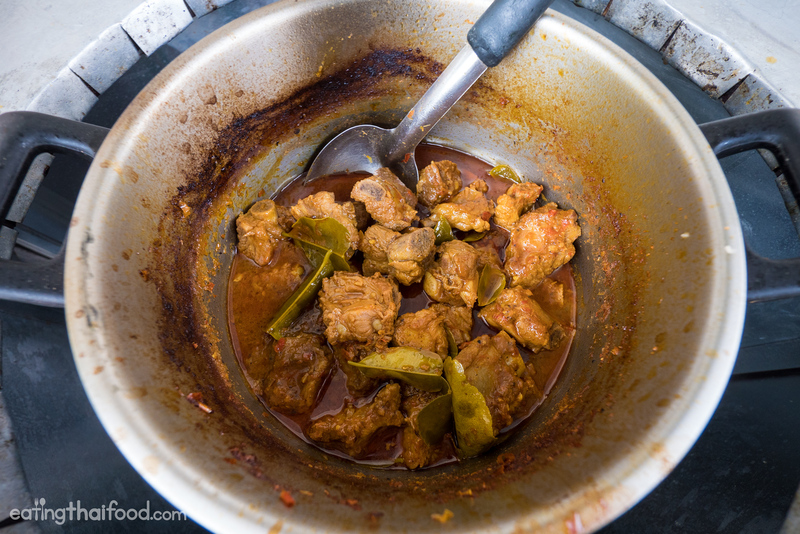 In Malaysia, we tend to fry the spice paste in oil till it is fragrant, before we add the meat and liquid. This is a key step in making a good curry. 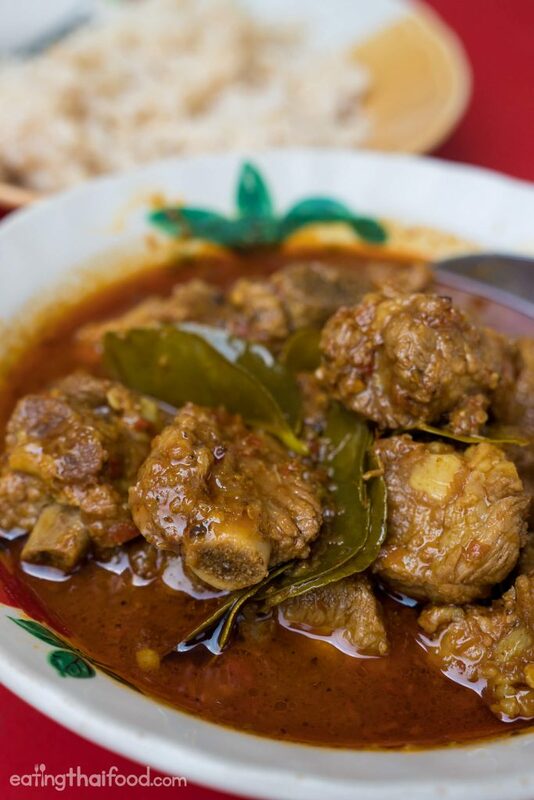 The only curry that starts of with all the liquid in it is the traditional beef rendang. 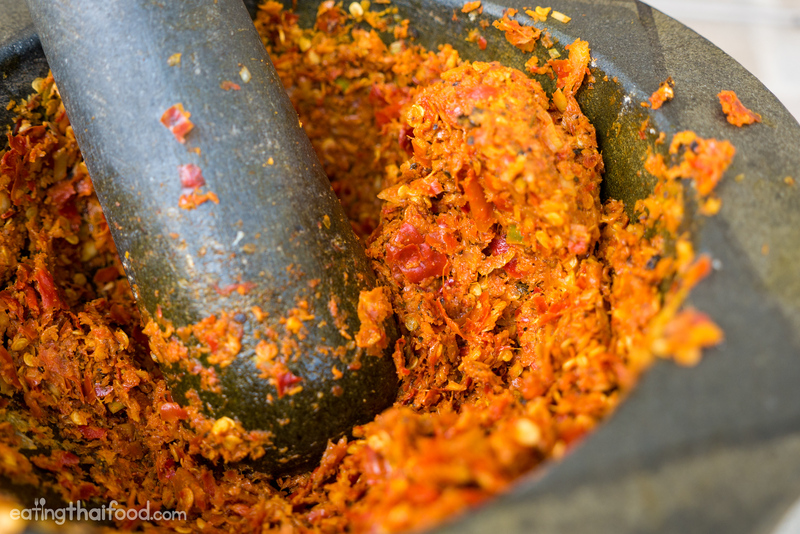 If you didn’t have an hour, and were too old and gimpy to get down on the floor with the mortar, could you do the curry paste in a food processor? Hey Dave, yes, you can definitely do that, and it still should taste very good. It makes me so hungry!! Great video and recipe Mark. Just love to watch all your videos, i will be traveling to thailand next year and will be visiting many of the restaurants you have shown. Keep up the good work and if your around would love to buy you a beer or two along with of course some food. Thank you very much Tony, thank you for the offer! Looks awesome… living in Spain… can I use normal lime leaves? Thank you Bill. I don’t think normal lime leaves will give off the flavor, so it’s alright to just leave them out. Enjoy! I will be trying out this dish this week. It looks sooo good. Thank you for your recipes. They are much appreciated. You’re welcome, thank you Usha. Thank you very much Manoj, glad you enjoy Thai food! First time I had this was when a colleague brought it in to the office for lunch, along with kua kling. Living in Khon Kaen, you have to hunt a bit for southern food, although it’s a bit easier to find when you know about it. I had him write the names in Thai and showed them to my Udorn Thani wife (who is an excellent cook). She said, “No problem. I can make that.” And she did. Very well, too. So, that become one of my mainstays. Hey Tony, great to hear form you. Great story, thanks for sharing, and glad your wife can make a good version of this dish too! It is so delicious, I like the Thai food very much. Thank you for posting such a wonderful recipe. You’re welcome, thank you for reading Saji. Glad you enjoy Thai food so much! Excellent. Everything you do is very professionally presented. I shall be trying this recipe. Thanks for sharing these delicious Thai recipes Mark. I’m Thai and I cook Thai food all the time for my friends and family. I have used a few recipes from your food blog. All turned out great. Thx again. Hey Jo, great to hear from you. Glad some of the recipes have turned out well, thank you for your support. I love spicy food especially Thai food from the motherland. I will follow you because your show is awesome! Thank you Alyssa. Glad you enjoy spicy food as well! Hi Mark, I love this recipe. It’s one of my favorite dish when I was a kid in the southern of Thailand. Thank you so much. Great to hear that Nui, thank you! Izumi and I replace the pig with pressed-Tofu & hot-chili-peppered-oil pan fried Tempeh…. Thank you for sharing Godfrey! Awesome to hear that Aileen, hope it turns out well! OK. I know I already commented on your vlog (and thank you for hearting my comment). But, yes. After I watched the vlog several times, looking at the recipe, and taking inventory of my pantry, I knew I immediately had to make this dish today! I have not even sat down to eat my dinner yet, but I can tell you that this recipe is outstanding!! I’ve been picking at it all afternoon. I chuckle when I think of your mother-in-law tasting and touching her throat. I totally get it as I did the same thing. But the longer it cooks, the spiciness just mellows a bit. SOOOO delicious. Just a couple of things, though. Unfortunately, I have not yet located coriander root, so I substituted cilantro stems mashed in with the other ingredients. As well, I could not afford spareribs (I live in the US) so I bought what was on sale, namely, pork loin chops cut very thin with bone in and cooked the Dickens out of them. Jasmine rice and HELLO… we are good to go! Mark, all I can say is, THANK YOU!! and thanks to your talented mother-in-law for being so accommodating in sharing her recipes. I have knowledge that Thai people can be shy and very humble and it shows through the camera lens. Very endearing. Keep up the good work, Mark. I think I can speak for others when I say, “You make my day.” Looking forward to seeing the next episode on Wednesday! Kind regards to you, Ming, Micah and family! Hey Patricia, great to hear from you here too. That is awesome that you already made this curry, glad it turned out so well. 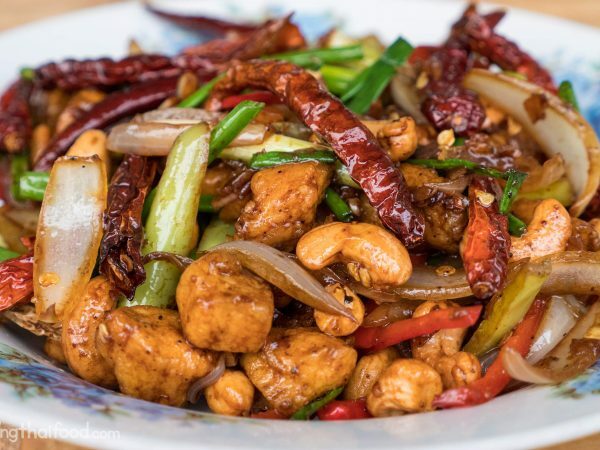 You’re right, the chilies are spicy, but they do mellow out and blend together well with the meat and all the other ingredients, so it’s spicy, but not a sharp fiery spicy – it’s kind of a building spicy. Thank you for sharing your substitutions as well… I with it wasn’t so hard to get the cilantro roots. Thanks again, hope you’re doing well! Thank you very much Kay, haha, glad you could almost smell it! Looks great but I’m sure a little too spicy for me. My wife Ying likes the real spicy! I like nid noi. Was wondering if you could email me or give me an email address for you so I can contact you, as I have a few questions for you. Thank you very much Wandalina! love pork curries. will try once i find some nice ribs!! thanks Mark! An amazingly delicious looking recipe. I’ll be trying it out soon, but must confess I will have to use the Good Boy canned Curry Chili Paste. Thai ingredients really limited here. Hey Lee, great to hear you’ll be trying out this recipe! Looks awesome! Will definitely try soon. Recette superbe, j’ai hâte de la faire ! Si vous avez besoin de correction pour écrire les recettes en français je le ferai avec plaisir. N’hésitez pas a me le demander. Fantastic, video. Thanks for the wonderful recipe. Makes me very hungry. Thank you for watching and reading Tip! Hey Joshua, wow, thanks for already trying this out, glad you enjoyed it. That’s a good idea with the extra slow cooking! Thank you very much Tahira, oh mutton sounds amazing! OMG I love this!!! And honestly love you & your posts/videos! Nothing beats the joyous expression on your face ….makes me happy???????????????????????????????? Thank you very much Ami, really appreciate you watching! Thank you for this amazing recepie. Looks super tasty. Gonna try it out soon :D. Keep going with the great work mark. Cheers ! You’re welcome Pavan, thanks for reading. Let me know how it turns out!